Ahh, we are well into the throes of the holidays, with Christmas right around the corner and chants of “Fahoo fores, dahoo dores, Welcome Christmas, Christmas Day” in the valley below… er, that is if you were living in Whoville or perched atop the peak of Mount Crumpit overlooking that tiny village. Of course,Dr. Seuss’s classic tale, How the Grinch Stole Christmas, reminds us that there is more meaning to Christmas than presents and bows, lights and roast beast (though I’ve yet to try roast beast). There’s an even more important issue to use geo-nerds residing in fantasy land – is there a real Whoville? Well, Hollywood crafted the town for Ron Howard’s 2000 remake starring Jim Carey. But that Whoville has since been deconstructed with old props likely floating around some Los Angeles-based studio. A Google map search doesn’t bring much help – nor does a search of place names in the GNIS database. There is a Whoville Lane in Milton, Delaware, a dead-end road that I’ve actually driven by once. The only other Whoville-named road that I could quickly find was a Whoville Way in Mount Desert, Maine, just south of Bar Harbor in Acadia National Park. So I took another route with this one – I checked to see if any sort of Mount Crumpit actually existed. Could the home of the Grinch’s lair direct me to this enchanted land? Well, there is one Mount Crumpit, apparently unofficially named, in the aptly titled “Crumpit Woods” near Squamish, British Columbia. According to this little stat sheet the mountain peaks out at around 1,086 feet, which is well short of the 10,000+ feet that the Grinch supposedly traverses after looting Whoville clean of Christmas. But check out the above photo, courtesy of a Panaramio user on Google. Tell me that doesn’t look somewhat like the craggy peaks featured in The Grinch with a cozy little town settled in the valley. You’ll have to suspend your disbelief to include the body of water, but this does seem to paint a pretty accurate visual of the original. 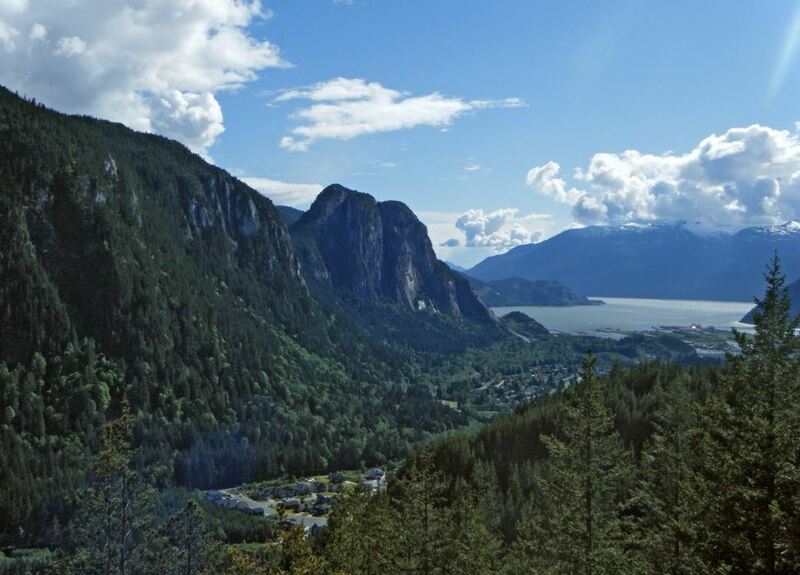 From this view you can see the Stawamus Chief – which is one of the most impressive granite monoliths on the planet. This all adds up to what seems to be a great location for a dastardly, mountain-dwelling creature. Well, if you can’t travel to Squamish for a near-to-real-life Whoville experience, there’s always your television set. Tickets to Vancouver for the holiday are settling in around $1,200 at this 11th hour, so I think I’m going to settle for the Seuss classic on DVD. Happy Holidays everyone!